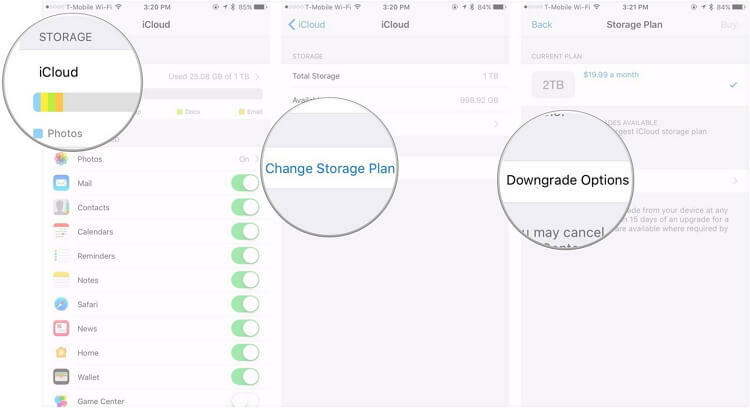 How to Cancel iCloud Storage Plan on iPhone? If you have been using iCloud and you are thinking of canceling your storage plan, you will be happy to know that this is totally possible. If you happen to cancel iCloud storage plan within 45 days after paying for your annual plan you get to receive a refund. But, how do you go about? Don’t you worry, the article here tells how to cancel iCloud storage plan on iPhone and the preparation work you need to do. How to Cancel iCloud Storage Plan on Mac? How to Cancel iCloud Storage Plan on Windows? 1. How to Cancel iCloud Storage Plan on iPhone? Step 1: Open Settings. If you use iOS 10.3 and later, just select [your name], tap on iCloud. The storage plan you are using will be showed. For iOS 10.2 or older versions: Open Settings > iCloud > Storage. Step 2: You need to tap Change Storage Plan. Step 3: Tap Downgrade Options. Enter the Apple ID Password. Step 4: Select the option of 5GB Free and then tap Done. You may know how to cancel apple iCloud storage plan but still, have some files you need to back up on your iOS device. You don’t have to opt for another paid plan. There are free backup tools available. 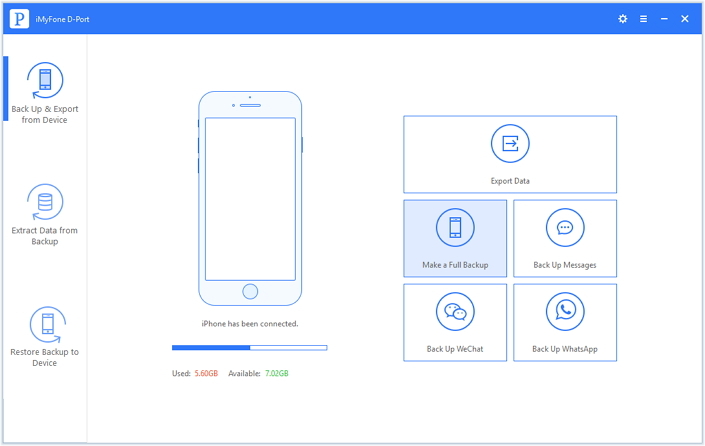 One perfect free backup tool that can replace iCloud is iMyFone D-Port. Back up your WeChat/SMS/WhatsApp messages only or your whole iOS device, for free. Export more than 18 data types selectively from all your iOS devices, such as notes, messages and much more. 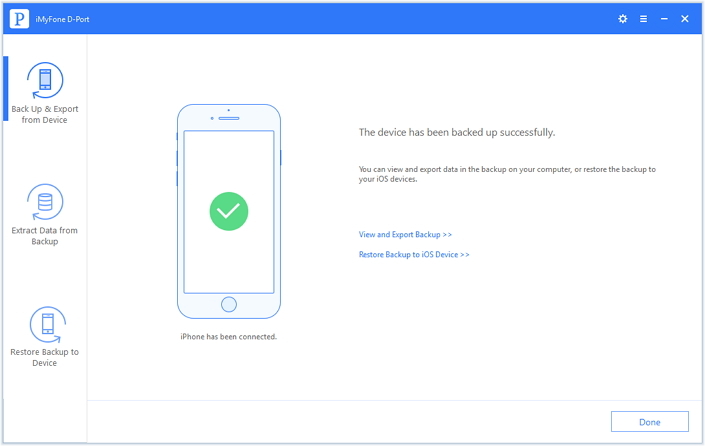 Access your iCloud backup without the need to have an iOS device at hand. Export the data available in your iTunes backup without having to restore the data to an iOS device. Step 1: On the left Panel, click Back Up & Export from Device. Select Make a Full Backup. Step 2: Click the Back Up button. Keep your device connected for the backup to complete. You will receive a notification when the backup finishes. You may also interest in cancel iCloud storage plan on your computer. Just follow the instructions below to learn how to cancel apple iCloud storage plan. 3. How to Cancel iCloud Storage Plan on Mac? Step 1: Select Apple, then System Preference, and then click iCloud. Step 2: In the bottom-right corner, click Manage. Step 3: In the top-right corner click the Change Storage Plan. Step 4: Click Downgrade options. Step 5: Enter an Apple ID Password. Click Manage. Step 6: Choose another Plan and Click Done. 4. How to Cancel iCloud Storage Plan on Windows? Step 1: Open the iCloud for Windows and Click Storage. Step 2: Click on Change Storage Plan and then Downgrade Options. Step 3: Enter an Apple ID Password. Click Manage. Step 4: Select another Plan and Click Done. If you are already using iCloud storage plan, you can easily cancel it by following the steps outlined in this article. But if you have important data on your iOS devices, you don’t have to pay for your iOS device backup. With a free backup tool such as iMyFone D-Port, you can selectively back up your device for free. Try it now!